1. Oils with high omega-3 content (i.e. : hempseed oil, flax oil, walnut oil) are unsuitable for cooking. They should only be used to make raw dips and sauces, salad dressing, or to drizzle on food once it has been cooked and plated. 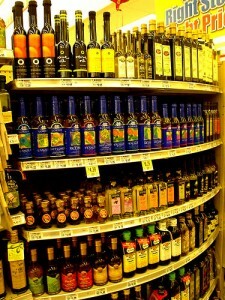 Once opened, these oils should be refrigerated (if possible, purchase them already refrigerated). 2. Deprogram the “all unsaturated oils are healthful” slogan out of your head that has been drilled into the American public for decades. Some of these unsaturated plant oils offer large quantities of omega-6 fatty acids. Although omega-6 fatty acids are necessary (without them, our blood wouldn’t clot), the average American currently consumes too much of them, which is bad news from an inflammation standpoint (high cellular inflammation is theorized to be a main culprit behind several chronic diseases). The worst omega-6 offenders? Corn and cottonseed oils. Not surprisingly, these oils are subsidized by our government, and ubiquitous in processed and fast food. Scary PS: Unless labeled ‘organic’, you can count on them also being genetically modified. 3. Make amends with coconut oil. It has been unfairly vilified for decades by government guidelines and federal health organizations, but there are significant amounts of clinical research which shows that its main fatty acid –=- lauric acid — helps maintain healthful cholesterol levels. Try it in savory recipes (like chili) or use it to make stovetop popcorn at home. Since coconut oil has a very high smoke point, its fatty acids can withstand high degrees of heat without oxidizing (once a fat oxidizes, its healthful benefits are gone). 4. Tread carefully with canola oil. The seed from which it is extracted — rapeseed — receives heavy pesticide treatment And, unless labeled ‘organic’, it is very likely genetically modified. Additionally, most canola oil is refined and undergoes a significant amount of high-heat processing, which worries me since its fatty acids are rather fragile. The occasional tablespoon of canola oil in a baking recipe that serves 12 is no cause for concern, but I do not recommend it as a staple cooking oil. 5. Although we hear a lot about the importance of buying some produce organic, the same is true for all oils. Many pesticides are fat-soluble, which means they accumulate in a plant’s fatty acids and oils. 6. Light and air can quickly deteriorate oils’ healthful properties, particularly olive oil (which contains a high level of antioxidants). Leaving an opened bottle of olive oil on a counter for just a few minutes can have a detrimental effect on its antioxidant content. To minimize UV light damage, purchase olive oil in tin cans whenever possible. 7. A lot of commercial plant-based oils (mainly corn, sunflower, and safflower) undergo a heavy amount of processing, including deodorizing (to provide a neutral smell), bleaching, and anti-foaming agent treatment. For optimal health, these oils are better off consumed in an unrefined state (which, in most cases, isn’t available for purchase). Keep in mind, too, that in an unrefined state, these oils can withstand much lower cooking temperatures, and should also ideally be stored in the refrigerator. The deodorizing and bleaching processes are particularly worrisome as they expose these oils to temperatures well past their respective smoke points, thereby increasing the likelihood of their fatty acids undergoing oxidation and turning into harmful compounds. Although the deodorizing treatment does add antioxidants, these are not always the same ones originally found in the oil. Anti-foaming agents, meanwhile, are silicone-based compounds (one of the most common anti-foamers, polydimethysiloxane, is the main ingredient in Silly Putty). My general rule for oil? Use ones extracted from foods which are naturally high in fat. Not coincidentally, nut, seed, olive, and avocado oils are far better choices than corn, vegetable, or cottonseed oils. 8. I reported on this over three years ago, but find that it continues to be worth repeating: a lot of commercial olive oil is not 100% olive oil (read this article from The New Yorker for all the details). This, of course, has huge implications from a health standpoint since these oils don’t provide the same heart-healthy fatty acid profile and antioxidant content of real olive oil. To make sure you’re getting real olive oil, I suggest one of the following: purchase from these producers certified by the California Olive Oil Council, look for this International Olive Oil Council stamp of approval, or at the very least look for this Protected Destination of Origin symbol (which I learned about from my friend Robyn Webb), which guarantees that the olive oil you are buying was produced, processed, and bottled in the same estate (thereby eliminating the possibility of shady tampering). One last important note: I recommend that the majority of your daily fat content come from whole foods that contain fats (i.e. : nuts, seeds, olives, fatty fish, coconut, unsweetened cocoa), as these foods deliver healthful oils along with bonus phytonutrients, fiber, vitamins, and minerals. Congratulations — you are now a graduate of Cooking Oils 101… with honors! wow i didn’t know that about canola oil! if you don’t recommend cooking with canola oil, what alternative oil would you suggest? seems like olive oil for sauteing isn’t necessarily the best idea b/c of its low smokepoint. maybe peanut oil? so which oil is most suitable for stir frying? Something else to print out and keep on my fridge! Good report on cooking with oil. We have 20 times more Omega-6 than we need and causes major health problems such as heart disease. Fix is to increase Omega-3 and decrease Omega-6. Me encantò muy claro y didàctico como siempre. Felicitaciones. Cada vez que leo algo relativo a este tema, me viene a mi memoria gustativa el aceite de oliva que me enviaba mi abuela paterna desde Portugal, hecho con sus propias aceitunas orgànicas y procesado totalmente artesanal por ella misma. Nunca pero nunca màs en mi vida volvì a degustar un aceite de esas maravillosas caracterìsticas. Great info as always. A few comments/questions. 1) olive oil in opaque bottles another alternative to tins (though my fave comes in a tin). 2) macadamia nut oil another good one (love coconut oil). Canola, what do you think of organic, expellar (sp) pressed? Just wanted to let you know your link for the International Olive Oil Council stamp of approval is the same as the California Olive Oil Council. Great website! Obviously, those are the worst possible choice for olive oil, since they are constantly exposed to both light AND air. Sorry to double comment, but I have questions. Which oil do you recommend for a general purpose cooking oil? Right now I’m using grapeseed oil (non-organic I’m pretty sure, from Costco). I used extra virgin olive oil for years until I learned that high heat cooking with it is a bad idea. It sounds like from your list that coconut oil is the best option, but what about when you don’t want the coconut flavor in your cooking? Does refined coconut oil offer any of the good properties found in virgin coconut oil? Lovely piece. The suggetsions about how to use coconut oil are appreiciated– I have a container in the fridge but no particular ideas for use other than baked goods and coconut rice. I also especially like the note at the end encouraging use of whole foods as the primary source of fats in the diet. Any excuse to eat more olives! Christine & Rob — I would suggest coconut oil (I use it often in stir-fries; it does NOT impart a coconut flavor! ), peanut oil or an olive oil that is not extra virgin. Yes — opaque bottles are a good alternative to tins. In terms of canola — organic and expeller-pressed still does not convince me because, for an oil so high in omega 3s, it is exposed to quite a bit of heat during that process. For general purpose cooking, I recommend peanut, olive (just not extra virgin) or unrefined coconut (it really does not impart a coconutty flavor to foods; I use it for stir-fries and savory chilies all the time). Grapeseed is fine, too (it is not my “go-to”, but you could certainly do worse). The “unrefined” is healthier, but has a smoke temp listed as 285 on the jar. Can I still bake with it, if baking usually is at 350? The “refined” version has a smoke point of 365. But this is more processed. Would this be safer to use for baking at 350? I think it’s still a better alternative than the non-organic Earth Balance shortening I’ve been using. I know many people who use coconut oil for baking with no issues. Saint Julia Child was right all along. The only oils she endorsed were peanut oil for high-heat stove-top cooking, olive oil for everything else, except when REAL unsalted butter is needed for the delicious richness it brings. Nothing else will do but those three choices. Simple, really. For those wondering about what to fat/oil cook with – why isn’t anyone thinking of beef tallow, lard, and duck/goose fat (ghee, too)? These are traditional dietary fats with great smoke points, and they are very slow to become rancid compared to oils. These important fats have a long, long history in cuisines that nourished humans all over the world, plus they taste great with wide variety of baked, roasted, and sauteed foods. *These* are the fats your great-grandmothers saved and prized. She never reached into her cool root cellar for bottles of hipster oils like flax & hemp, LOL. Get real. So my husband and I were wondering the best oil for seasoning cast iron. Will unrefined coconut do? At 65, with high cholesterol and blood pressure (if I don’t exercise regularly), and a father who died of a stroke at an early age, I want just one nutritious/high heat oil I can use in cooking and salads. Looking at your chart, it would seem that Tea Seed, Avocado, and Apricot Kernel might fill the bill. But, Tea Seed Oil is VERY expensive, and the only Avocado Oil I can find is refined through cold press. Which oil would you choose? Have You Noticed More Rapeseed Fields This Year?